Carlos Santos-Silva was born on Nov. 4, 1977, in Wiesbaden, Germany, the son of Francisco and Monika Santos-Silva. In 1996, when he and his family were living in Clarksville, Tennessee, Carlos joined the United States Army in Fort Campbell, Kentucky. 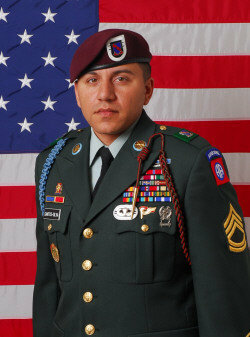 On March 22, 2010, Sergeant 1st Class Carlos Santos-Silva died from a roadside bomb attack while on patrol in Kandahar province, Afghanistan. He was laid to his final Hero's rest on the hallowed grounds of Arlington National Cemetery on April 12, 2010. Carlos Santos-Silva is survived by his wife, the former Kristen J. Anderson, whom he married at Ft. Campbell, his 11-year-old son Cameron Santos-Silva, his parents Francisco and Monika, and his brother Dominik. Santos-Silva was born on an Army base in Germany and moved around the country as a boy, following his father's postings at various bases. He joined the Army in August 1996, in time to serve with his father and brother at Fort Campbell, Ky.
"All three of us served there at the same time for three years," the father said. "We were together there until 2000, when I retired and moved to Knoxville." Santos-Silva's military career started out in in the 101st Airborne as a medical supply specialist, and then he moved to the 10th Mountain Division in Ft. Drum, New York, as an infantryman, and from there he joined the 82nd as a paratrooper. His final role was as platoon sergeant with Charlie Company, 2nd Battalion, 508th Parachute Infantry Regiment, 4th Brigade Combat Team. "an amazing leader, teacher, and mentor. Everything I learned from him was valuable to me in Iraq"
"a best friend to my brother and I. We all went to Prom and graduation together in TN." "a great man and great leader ... he was tough but he was right he made men and soldiers out of us ... I owe everything to that man." "My son...looked up to Carlos as his leader and friend, and Carlos was there for him in his time of need." "My husband...always talked very highly of SFC Carlos Santos-Silva." "the epitome of a noncommissioned officer, a true standard bearer ... He cared deeply about his paratroopers, and they cared deeply about him. His men routinely looked to him for leadership guidance, which he readily gave. He was loved by all in the battalion and made you proud to serve." "I'll always remember him as a better soldier than I was," said his father, a retired command sergeant major. "I looked forward to seeing him finish his career and achieve levels higher than I did."